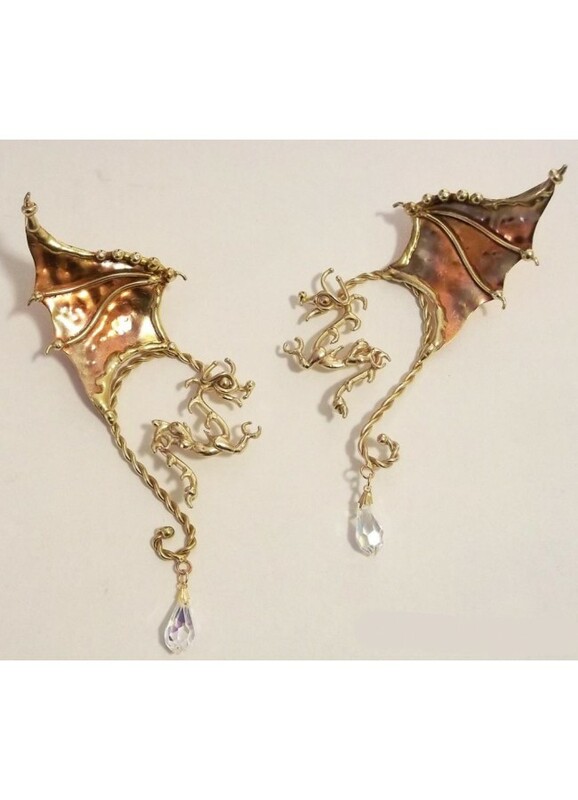 A dragon takes flight in this amazing hand made bronze ear wrap with crystal drop. Absolutely stunning! This winged dragon ear wrap is hand made of bronze and copper with a sparkling crystal drop. Created by a true artist, these dragon ear wires wrap around the back of the ear so the dragon hangs in front and the wing rises from behind the ear. Non-piercing, the bronze is strong enough to hold its shape and malleable enough to adjust to your ear. Choose one for left or right ear (sold singly), yours will be individually hand made then coated with a clear laquer to preserve the shine so they never need polishing. Item Number: BZ-EARDRG | Approximate Size (Inches): 2.00 wide x 0.25 deep x 5.00 high | Approximate Shipping Weight: 0.50 lbs. Beautifully fashioned winged dragon is bronze with copper wings and a lovel..